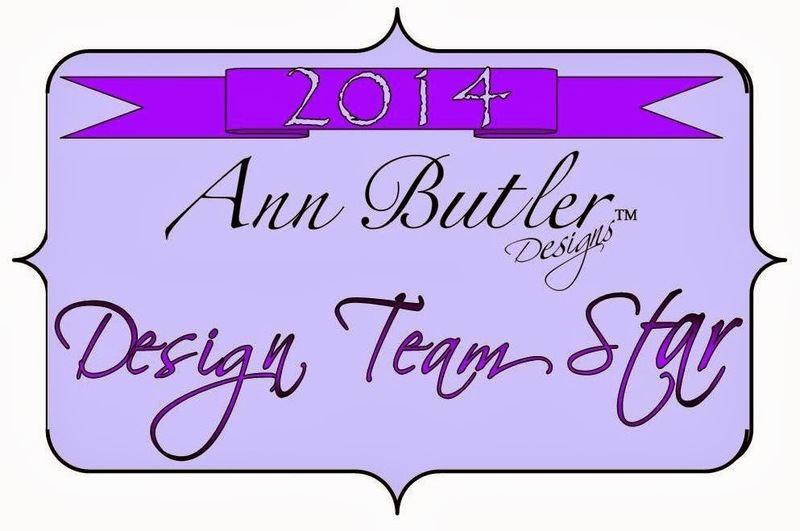 Welcome to the Ann Butler Designs/ETI Blog Hop! Please visit each blog and leave a comment to be entered for the blog candy. 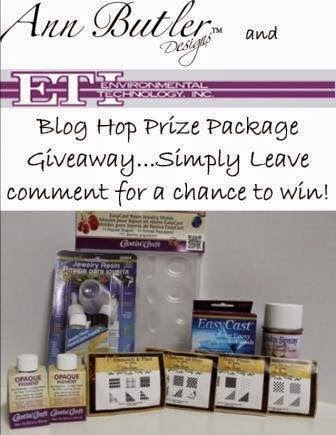 YES, a comment on EACH blog gets you an entry for the BLOG CANDY shown below! Share the fun with your friends! We will Pick the winner on Saturday the 20th and announced on the Ann Butler Blog and ETI blog! Again, make sure and visit all the links and leave a comment. Here is my project for the hop. 1. For the card base, cut aqua cardstock 5 3/4"W x 11 1/4"H. Score at 4" and 9". Cut pattern paper 5 1/2"W x 3 3/4"H and adhere to bottom potion of the card base. Cut another piece of pattern paper 5 1/2"W x 2"H and adhere to the top of the card base. 2. Cut vanilla cardstock 5"W x 1 1/4"H. Using the limelight inkpad, stamp the cardstock with striped stamp. Cut vanilla cardstock 2"W x 1 1/4"H. Stamp the word image with the limelight inkpad. Cut 3 pieces of the vanilla cardstock 1 1/4"W x 1 1/4"H. Stamp the images with the aquamarine inkpad. Ink the edges of all of the cardstock papers. 3. Cut a piece of aqua cardstock 1/4" larger than each of the stamped images. Adhere the aqua cardstock to the stamped images with Zip Dry glue. Next, adhere all of the stamped images to the card base. Note: See picture for placement. 1. Cut the pattern paper and cardboard 3/4"W x 2 3/4"H and adhere together with Zip Dry glue. Place the papers into the metal frame. Adhere the metal charms to the papers with glue. Please visit these blogs for the hop! This is the fabulous prize package! I am so excited to share this new book, Upcycled Jewelry by Linda Peterson with you. I have known Linda for a number of years and she is one of the most talented designer I have ever met! So, when she asked me to be part of this hop, I couldn't say yes fast enough. Her new book, Upcycled Jewelry, showcases her talent with pure perfection. Each page of the book has stunning photography and step by step instructions that are easy to read and follow allowing anyone that wants to recreate one of her projects to do so without feeling overwhelmed. In other words, you don't need to be an expert in jewelry making. One of the things that Linda asked the designers that are participating in this book review blog hop, was to pick one project out of the book that we liked the most. That was not an easy task to complete. There are tons of projects in this book that I absolutely love, but I did narrow it down to two that I'm sharing today. The Zip It earrings on page 45 are one of the coolest project I have seen. They are fun & funky and I am definitely going to make a pair for myself and my daughter. The other project that I love is the Retro Studded Cuff bracelet on page 78. It is simply gorgeous and I couldn't believe that it was made from a rubber inner tube! Upcycled Jewelry is a book with 128 pages of beautiful jewelry pieces and handbags that I would recommend for everyone to purchase as soon as you can. You won't be disappointed. As I said earlier, it really is pure perfection! Thank you Linda for sharing your fabulous talent with the world and making it a better place with beautiful creations. You really are one of a kind! As one of the editors at of Bella Crafts Publishing I am very excited to announce the launch of our very first book collaboration with the talented Tiffany Windsor. Tiffany is the creative genius behind Cool2Craft and the founder of Cool2Cast, a brand new craft product on which the new book Cool2Cast, is based. 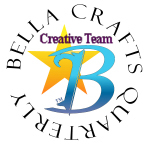 Cool2Cast is filled with tips, techniques and ideas for jewelry, home décor and other embellishments. In this new book, you will find fabulous project ideas using Cool2Cast, as well as a gorgeous gallery of project images to inspire you. I am so excited today to be part of this fabulous new blog hop! The products that we will be showcasing today are created by two of my favorite people, Tiffany Windsor from Cool2Craft and my business partner, Ann Butler from Ann Butler Designs. There are 13 very talented designers participating in this hop to show you 13 different creative ideas for Tiffany's new Cool2Cast casting medium and Ann's line of stamps, inkpads and iridescent paints. So, grab yourself your favorite drink and hop on through for a whole lot of creative fun! stamp to create the two-tone effect. Dry the ink with the heat tool. is dry, paint with iridescent paints. Let dry. Spray with clear sealer. Let dry. flowers with Zip Dry glue. Tiffany has put together an awesome prize package of Cool2Cast items….to enter simply leave a comment here. For more chances to win and to see other great projects using Cool2Cast and Ann Butler Designs products check out the rest of the blog hop below and leave a comment for each of them. Deadline for entering the giveaway is August 8th, 2014 at 11:59 pm. Don't forget to stop at the following blogs for more wonderful inspiration!!! 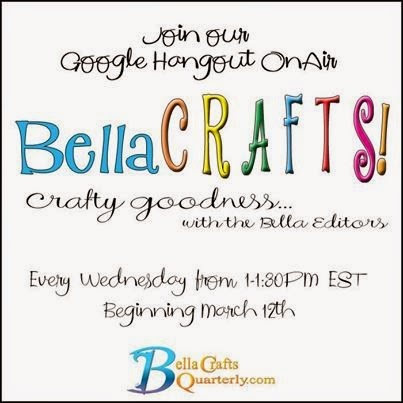 Every Wednesday at 1:00pm EST the editors of Bella Crafts Quarterly host a Hangout and on today's hangout, we answered some of your craft questions. I thought I'd share the video with you in case you missed it!